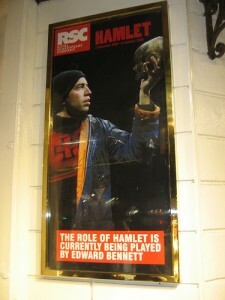 Here comes my (rather late) yet another Hamlet review (as attended on 23 December 2008). Disclaimer: This is going to be a theatre review. I am by no means entitled to write one. In my whole life I have been to less than 10 plays. 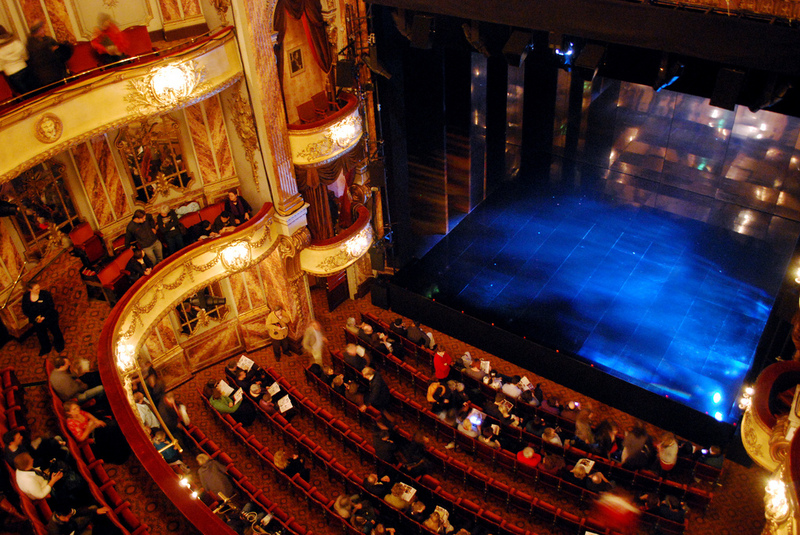 Although I am really interested in the concept of theatre and everything that I hear about it, the first 29 years of my life I had hardly any money and the last 3 years I had hardly any time. Since I came to London I have decided to change this. It would be a shame to reside in this city with such a big theatre tradition and so many (apparently) marvellous productions to go to and not to take advantage of this. So, my first theatre experience here in London became to be the RSC‘s production of Hamlet the day before Christmas Eve. Yes, I have to admit, I have been drawn to that production especially because of its two main stars — David Tennant (“The Doctor“) and Patrick Stewart (“The Captain“) together in one play: each sci-fi geek’s dream come true. 😀 And, of course, I was a bit disappointed when David Tennant had to retreat due to a prolapsed disk and had to be replaced by his understudy. But the fact that I was most disappointed of was not that I could not see his Hamlet (which I could never miss if I never saw it), but more the ticket price I had to pay and its sudden drop in value which meant I could not get rid of the second one that I had bought. Although I had my camera with me, I somehow did not make a single photo. wolfsavard seems to have had nearly the same seat as I had, so if I had made a photo, it would have looked exactly like this. As boring as it may sound, the (chronologically) first impressive thing about this production was the building, the Novello Theatre. 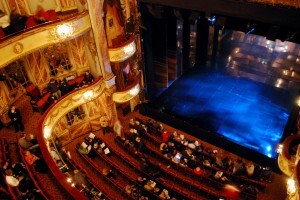 (This may be due to my not knowing many theatre buildings, I suppose most of them are similar in splendid extravagance.) But just sitting there in itself was a great experience. I had one of the cheapest tickets and worst seats (very, very high in the balcony), but still the seat was quite good and I could hear everything and see nearly everything. One thing I have heard is unfortunately quite common in theatres and annoyed me a bit: Being December there was a lot of coughing going on. It could have been worse, though. Polonius: Everybody liked him. It is most probably the comic relief that just works. As I especially like weird old male characters the best, Oliver Ford Davies was the perfect choice. Hamlet: Most of the reviews have, of course, been written about Hamlet’s portrayal and the terrible pressure on Edward Bennett (“The Understudy”) and the fantastic way that he saved the play. There is nothing more to add to those. He definitely deserves all the praise he got. Claudius/Ghost: One thing I noticed about Patrick Stewart was that most of the time he was talking in a very low voice. I do not know if he was supposed to do that or if he probably had a cold. But I also noticed that he was perfectly audible nonetheless! Another slightly unpleasant thing that I was wondering about: Many of the actors were often too aggressive … I know theatre is supposed to be exaggerating, but I still prefer a realistic approach. Why were they shouting so often? It is okay for a madman (Hamlet, sometimes Claudius, sometimes Laertes) to shout now and again. But many times I was distracted by the thought: Whoa, they are reacting way too emotional! There was really just one scene I did not like: The “play in a play in a play” (the Dumb Show) was portrayed in a ridiculous way by the “clowns”. Although I am quite sure this was intended that way, I still found it fairly annoying. While reading the play, I could not understand why Claudius did not react to the Dumb Show (unfortunately I was not reading an annotated version). And I wondered if seeing its interpretation on stage would bring some sense to it. (I thought one way could be just merely hinting the “Clown King Poising”.) But it did not resolve anything and completely failed me. I was researching afterwards that the most common explanation would be the staging of this scene and that Claudius might not be able to see anything of it properly. If I had done the research before, I could probably have picked up what they had done to make this clearer. But as a play should work without prior research, this scene has definitely failed to work. The play lasted three and a half hours. At least for me as a non-native speaker, this was a bit too long. It seemed to be hardly abridged at all. (I was proud to even recognise a few of the missing scenes.) 30 or 45 minutes less would have suited me better. One of my two favourite scenes was clearly the gravedigger scene. Funny, tragic and witty in a most formidable way that I was not able to imagine while I was reading the play. The other one for me is Ophelia’s madness scene: This was the only scene which literally took my breath away. I was completely captured by the fragility and tragedy and brutality of this scene, the awkwardness, helplessness and inability to react properly to such madness and sadness. Praise to the costume maker: Forgive my reacting very female here, I am normally so not into fashion, but Gertrude’s dresses were just gorgeous! They certainly added to her majestic qualities. I really enjoyed the lighting in the opening night scene: They used reflections of their lanterns’ beams on the black surface floor as a way of lighting each other. This was just brilliant, especially as it brought a lot of movement into the scene and they kept using this device in more ways than I could imagine. 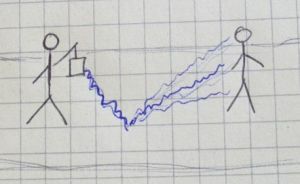 While I was reading the play (for the first time in preparation) I wondered how the ghost would be portrayed and especially if and what kind of special effects would be used on him. I thought they would be using a special kind of lighting and/or some fog. The actual way the ghost was presented in this production was a bit of a disappointment. It is still okay, as you do not really need any special effects to make the viewer understand that it is a ghost they are seeing. But it still would have added to the scene and I had looked forward to it. While slowly squeezing down the stairs after the show I had the pleasure of witnessing this conversation between an American and a British girl. And whose grave were they digging? This entry was posted on Saturday, 24th January 2009 at 16:30.